Crucifer and striped flea beetles react differently to their environment. This is especially noticeable in their response to neonicotinoid seed treatment, with striped flea beetles less susceptible to control by the insecticides tested. This highlights how important it is for producers to monitor emerging canola seedlings for evidence of flea beetle damage. This project investigated the differences in biology of two flea beetle species, P. striolata (striped) and P. cruciferae (crucifer), in order to better target management methods. The objectives were to quantify the risk of injury by flea beetles to Prairie canola production by: (1) determining the factors that affect distribution, spring emergence, flight, and feeding levels of the two species;, and (2) investigating reasons for seed treatment failures as well as alternatives to seed treatments for flea beetle control. The study involved investigating flea beetles at four locations: Carman, MB, Saskatoon, SK, Edmonton, AB and Beaverlodge, AB. • Both striped and crucifer flea beetles are more likely to fly from field to field when temperatures exceed 15°C. Crucifer flea beetle flight height decreased with increases in mean relative humidity. • Emergence timing was inconsistent in the studies. Striped flea beetles are active at temperatures lower than crucifer species, and typically emerge first in the spring. Crucifer flea beetles become active when temperatures are closer to 15°C, and are much more likely to emerge over an extended period in the spring. • Crucifer flea beetle damage to cotyledons nearly doubled with each 5°C increase in temperature from 5°C to 25°C. With two crucifer beetles per seedling, feeding damage at 15°C was below the economic threshold (25 percent damage) after seven days. At 20°C, two flea beetles can exceed the damage threshold after five to six days. At 25°C, two can exceed the threshold after three to four days. Canola should be inspected daily when temperatures reach 20 to 25°C. • Striped flea damage also increased as the temperature increased. 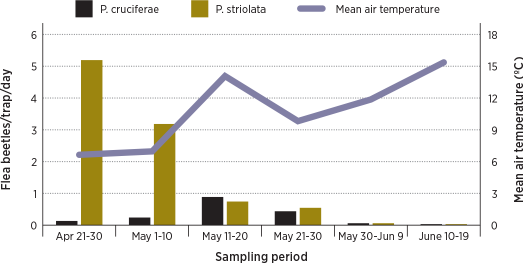 The economic threshold with two striped flea beetles per seedling was reached after seven days at 20°C and after four to five days at 25°C. 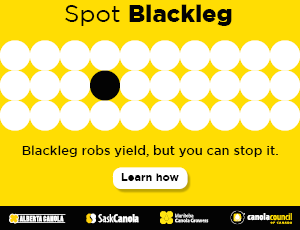 • Juncea canola is more susceptible to striped flea beetle damage at higher temperatures than are OP and hybrid canola. Figure 1. Mean number of flea beetles captured in mustard oil traps at Saskatoon, averaged over 2010-2011, and daily mean air temperatures for each sampling interval. Researchers used growth chamber experiments and field trials to determine the effects of temperature and soil moisture on the toxicity of neonicotinoid seed treatments to striped and crucifer flea beetles. They found that neonicotinoid seed treatments provided substantially better control and protection against crucifer flea beetles than striped flea beetles. Therefore, seed treatment failures are more likely to occur when striped flea beetles are the most abundant species. Seed treatment failures are also more likely to occur when above-average rainfall causes saturated soil conditions during germination and seedling emergence, and when high temperatures occur during germination and seedling emergence (20 to 30°C).